The T7406 wireless business phone is a full-featured, multi-line telephone for businesses that would benefit from a workplace mobility solution. It covers an area of up to 282,000 square feet and supports 1-6 people, enabling your employees to be more productive while moving about the office. It is ideal for small enterprises, branch offices, retails, medical offices, warehouses and manufacturing environments. Note: We now offer the newer T7406e phones complete with a 1-year warranty. 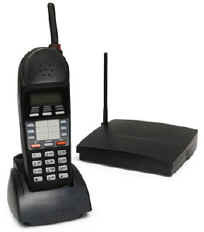 Add this wireless option to your Norstar phone system today! Local telephone companies: Buy Norstar T7406 phone at wholesale prices for your lease program.